Pandelys is a small village not far from Rokiskis. It was known as Ponidel in Yiddish. Hirsh Laib Sussman and Sauel Sussman of Philadelphia had a family newsletter called Sussmania, then Sussmanews. 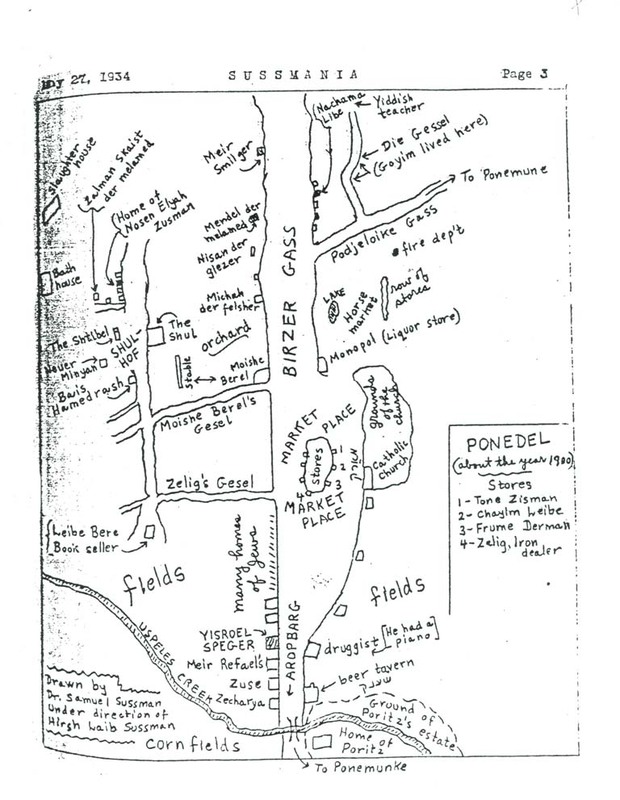 This hand drawn map of Ponedel appeared in the May 27, 1934 issue. Articles about Hirsh Laib’s trip to Ponedel are available here. Some records of the residents of Pandelys have been translated by the Rokiskis SIG. The surnames of the residents listed in the 1845 Family List are listed here. The surnames of the residents listed on the 1913 Real Estate Owners List are listed here, along with a picture of the real estate map. My husband and I visited Pandelys in June, 2001. We took photos and transcribed the inscriptions on the gravestones in the Jewish Cemetery. View them here. More pictures from my trip to Pandelys in 2001. There is a chapter about Pandelys in the yizkor book, Yisker-bukh fun Rakishok un umgegnt (Yizkor book of Rakishok and environs). It has been translated as part of JewishGen’s Yizkor book project. Read it here. The book, In Sacred Memory: Recollections of the Holocaust by Survivors Living in Cape Town, edited by Gwynne Schrire, was published by the Cape Town Holocaust Memorial Council in 1995 and contains a letter describing life in Ponidel. Read it here.